Lightens & Stiffens Guitar Neck While Improving Instrument Tone! 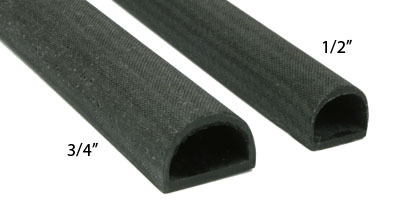 The Gemini Carbon Fiber D-Tube Neck Beam™ has been specifically designed to stabilize instrument necks due to its unique D-Tube structure. The Carbon Fiber D-Tube Neck Beam replaces the truss rod, significantly increasing both bending and torsional stiffness and weighs less than the removed wood! According to experienced builders and regular customers, the D-Tube Neck Beam also enhances tonal qualities of the instrument by opening up the mid-range. The D-Tube Neck Beam is available in 3/4" in both straight and tapered versions and 1/2" straight to fit virtually all necks. The 3/4" tapered version is designed to be used on thin necks while the 1/2" straight is designed for smaller necks such as a mandolin. Installation is quick and easy. Simply cut a groove in the neck using a 3/4" or 1/2" core box router bit and bond the beam into the neck. The straight beams require a groove of constant depth. For the tapered beam the groove is cut shallower at the head. The reduced depth of the beam near the head makes it ideal for thin necks. 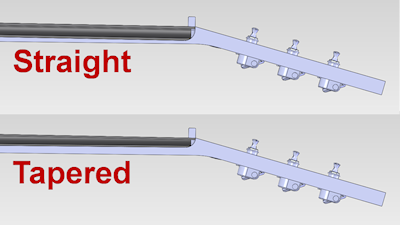 The D-Tube neck beam replaces the typical approach of truss rod and carbon fiber reinforcement beams with a one piece insert. Cutting the groove for the d-tube is a much simpler operation and requires less labor than fitting a truss rod and carbon fiber reinforcement strips. New D-tube Neck Beams and research about the product will be released soon. For more information on how to become part of the D-tube community, contact us. The Ultimate in Guitar Neck Bracing! This product is designed to work with our 3/4" D-tube Neck Beam. This accessory was developed to reinforce the heel of stringed instruments overcoming fundamental design weaknesses due grain orientation. This product is designed to work with our 3/4" D-tube Neck Beam. 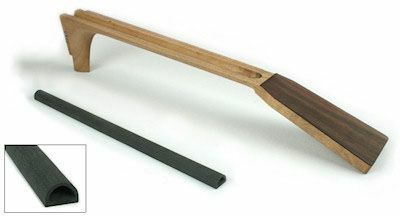 This accessory, similar to D-Tube Cradle, was developed to reinforce the heel of stringed instruments overcoming fundamental design weaknesses due grain orientation. Tee construction simplifies installation. 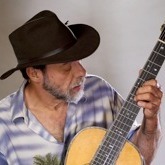 Christopher began building acoustic guitars in the mid-1970s. Today, Cozad Guitars produces a limited number of instruments for a select clientele from a shop located near Charlotte, NC. Immersed in the traditions of jazz, acoustic folk and blues, electrified rock and experimental music, Eric has been active as a session player, touring musician and designer of musical instruments for over 40 years. Michael Griffin uniquely enjoys incorporating the insights of a professional orchestral musician in his making/repair of violin family instruments, a combination of pursuits he has maintained over thirty-plus years. Harry Eibert operates a full service shop for the restoration, repair, and construction of stringed instruments. Specializing in vintage restorations with complete attention to detail and artistic execution of repairs. Custom instruments are designed and built to order. MacCubbin Guitars offers high-quality, custom handcrafted, steel string acoustic guitars. Built for the fingerstyle player and using only the finest materials, each guitar is individually crafted to exacting specifications, based on years of experience and knowledge. "My custom guitars are made strictly by special order. Each is designed around the needs, spirit and personality of the customer." David Gage is a one of the preeminent bass specialists in the world. He founded David Gage instrument repair in 1978 and has a shop residing in bustling New York city. David is multi faceted and caters to all bass players from jazz to classical to rock n' roll. 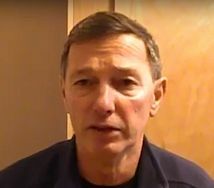 Ken Parker shook up the industry in 1993 with the Fly, the most unique solidbody design the electric world had seen in years. For more than 30 years now Ken Parker's primary passion has been advancing the art and science of archtop luthiery. James Ham is a professional luthier dedicated to the repair, restoration and new construction of violin family instruments and bows. James Ham was the first instrument builder to install our D-Tube in a bass. "My instruments are hand-built, one at a time, in my small shop, by me alone. I strive to be different by working one-on-one with my customers throughout the entire process, sending e-mail updates and pictures of the entire process." Lamarre specializes in making string-quartet instruments as well as double basses (contrabasses). It was Lamarre's desire to eliminate the risk of cracks in the heel that led to the design of the D-Tube neck cradle. "My passion for excellence in instrument making has led me to use every material at my disposal; many kinds of wood, carbon fiber, resins, and metals to create superior innovations in comfort and sound." D-Tube installed in a bass at 2012 Oberlin Bass Workshop. D-Tube installed in mandolins by Joe Hendrick. 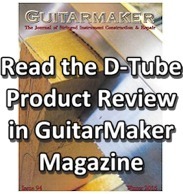 D-Tube installed in Guitars by Mark Frazier.